Q: What exactly is ‘fiber’ and why is it so good for you? A: Fiber is an indigestible carbohydrate, or a string of sugar units held together by bonds that human digestive enzymes cannot break. There are two types: soluble and insoluble fiber. 2. Maintains bowel function: Insoluble fiber speeds up the transit of food through your system, while soluble fiber slows it down. 3. Assists blood glucose control: Soluble fiber slows the absorption of glucose from the intestine into the blood stream, thereby preventing a spike (and crash) in blood glucose after a meal. This can lower the risk of type 2 diabetes. 5. May defend against colon and rectal cancer: Scientific studies are mixed, but insoluble fiber speeds up the removal of cancer-causing agents from the colon, while resident bacteria in the colon ferment soluble fiber, producing a beneficial compound that may help colon cells resist injury. Recommended Intake: Since most fiber-rich foods supply a mixture of soluble and insoluble fiber, recommendations are given without regard to type. The American Dietetic Association suggests 20 – 35 grams of fiber daily, which is about twice the average intake. That said, don’t overload on fiber and make sure to increase fluid consumption as you gradually increase fiber intake. 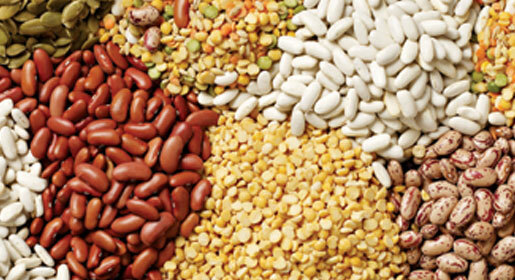 Fruits, vegetables, whole grains and beans are among the best sources of fiber! Also, remember that fiber supplements are not necessarily substitutes for whole, fiber-rich foods.